With the CONCACAF Champions League match between FC Dallas and Toronto FC halted last night, it reminded me that I have a couple pieces of video that I never shared. 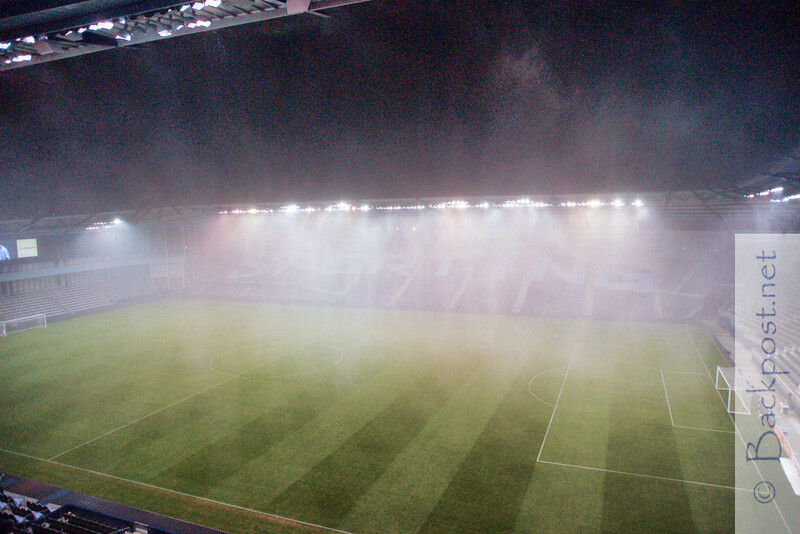 LIVESTRONG Sporting Park had it's first weather delay during the Open Cup Match with the Richmond Kickers. Considering the final result, the weather delay was the highlight of the night. When play was halted, I dashed inside and headed upstairs to get a view of the storm from relative safety and grab something to eat. The truly heavy rain and wind swept through while I was satisfying my stomach (not sure if leftover hot dogs in the press box count) but here you can see it rained pretty heavy for awhile. You can barely see the Sporting in the seats across the field. While I was up there waiting out the storm, I ran into Callum Williams (recently voted top ten announcer in MLS). It might be a surprise to some but he is not from around here and I thought it would be interesting to see his reactions to our little rain shower. In this clip is some video of the rain and then an interview with Callum with a special guest appearence by Sporting KC's design wizard Chad Reynolds.